Tell us when and where you want to go, and our experts will be in touch shortly! Naturetrek’s tailormade wildlife holidays allow you to create an entirely unique travel experience, designed and based around your own specific needs and wishes. You choose when and where you want to travel, the duration of your holiday and your personal budget. Our team of experts will be here to help and guide you along the way, with friendly advice, first-hand knowledge and inside information specific to your destination of choice. We will ensure the most competitive prices, superb naturalist guides and seamless ground services. Interesting cultural stops can be dovetailed into your itinerary to create a perfectly balanced holiday for you. If you already know where you want to travel, then it’s time to give us a call and start creating your perfect tour. We’ve had many years experience planning bespoke wildlife tours, so you can rest assured you’re in the safe hands of real experts. 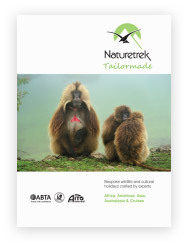 Browse our website and request the dedicated brochure for Tailormade Wildlife Holidays for ideas and inspiration. Call us on 01962733051 or email georgie@naturetrek.co.uk to speak to one of our specialists about your desired holiday. Receive your expertly crafted itinerary and book online or over the phone. Everything ran like clockwork. The guides and camps were exceptional. The unrivalled game viewing without any other vehicles in the vicinity was the best we’ve had in Africa. This was a safari for people who have already experienced previous trips – perhaps not for the first timer, but for us it was just amazing and we would certainly like to do it again. The ability to customise the tour entirely to our requirements, and particularly to birdwatch at a pace that suited my father, worked particularly well. Special mention to Jason Mitchell, whose wealth of knowledge about the animals of the local area and constant enthusiasm helped ensure a particularly successful and memorable trip. The travel arrangements worked like clockwork. Excellent itinerary using good accommodation. Fantastic sightings: 19 species of lemur, a tenrec and many excellent birds. Gracious, reliable and helpful driver – had a big impact on how much we enjoyed and understood the areas we drove through.